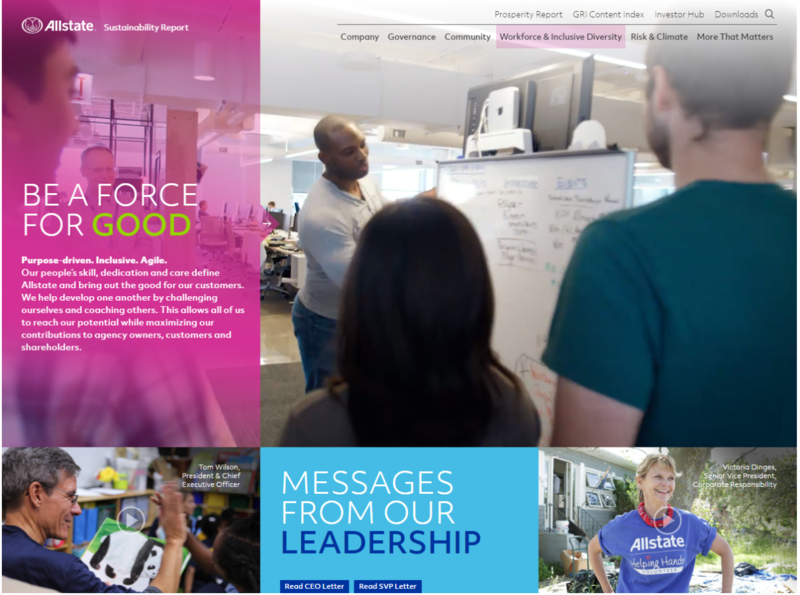 Allstate released its new Sustainability Report, highlighting achievements in reducing its environmental footprint, increasing the diversity of its workforce and building strong communities. This is Allstate’s 16th report on its accomplishments in five main areas: corporate governance, ethics, environmental practices, inclusive diversity and community involvement. It was developed in accordance with the Global Reporting Initiative Standards: Core Option framework, and features an Investor Hub that provides standardized metrics for investors interested in environmental, social and governance measures. Allstate earned a spot on the Dow Jones Sustainability Index, based on the company’s leadership in sustainability across the insurance industry. Allstate reduced its greenhouse gas emissions by 8% in 2017, on top of a 4% reduction in 2016. The Allstate Corporation, The Allstate Foundation, employees and agencies supported thousands of organizations to improve local communities with more than 250,000 hours of volunteer service. During the 2017 Allstate Giving Campaign alone, Allstate employees, agency owners and agency staff, along with Allstate’s match, raised over $7.3 million for 8,000+ nonprofits. Allstate was named to Fortune magazine’s 2017 “Change the World” list. For the fourth straight year, Allstate was named one of the World’s Most Ethical Companies by the Ethisphere Institute, a global leader in defining and advancing the standards of ethical business practices. Allstate was recognized as one of the Civic 50, the most community-minded companies in the United States, by Points of Light, the world’s largest organization dedicated to volunteer service. The company reached its goal of sourcing 9.3% of its spending from diverse suppliers. Find the report and read more at www.allstatesustainability.com.